We will not back down. And we will win this fight. 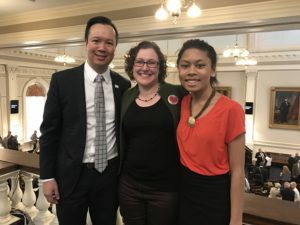 Today the New Hampshire House voted to table, without debate, a bill that would have provided transgender Granite Staters with critical non-discrimination protections. This is a shameful and disappointing delay. Thousands of New Hampshire residents, including legislators on both sides of the aisle, have expressed support for the basic fairness and freedoms this bill provides. We know that when legislators hear our stories and learn about the reality of our lives, we win. Last month, following testimony from transgender people, family members, women’s groups, and business and faith leaders, a Republican-led House committee voted 15-2 to support this bill. We will not back down. And we will win this fight. We will reintroduce this bill at the next possible opportunity, and we will not stop until transgender people have access to the full protections from discrimination that every Granite Stater deserves. We have created incredible momentum together – more people than ever before have voiced support for the rights of transgender people. GLAD will work with our partners in the Freedom New Hampshire coalition as long as it takes to secure full equality for transgender people in the Granite State. And I know that one day very soon New Hampshire will say yes to freedom for all. Thank you for everything you have done to get us this far. Together, we will get this done.